Hey there! Thanks for dropping by Ne Quid Nimis (Nothing Too Much)! Take a look around and grab the RSS feed to stay updated. See you around! 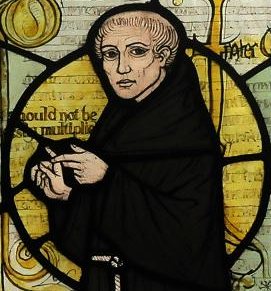 At left is William of Ockham, the late medieval philosopher who originated the so-called “principle of parsimony” (better known, it seems, as “Ockham’s razor”), which states that we ought to postulate only those entities that are strictly necessary in order to explain some phenomenon, and furthermore that the simplest explanation for something is usually the right one. Most educated people living today are familiar with this principle in some form, and particularly those philosophers that do work in the philosophy of religion seem, in my experience, to make use of this principle more than anyone else (here I must also briefly note the irony of the way in which the principle is often employed by Atheists against religious believers, considering it was a Christian theologian who formulated it in the first place.) But in any scientific field, and many areas of philosophy as well, this principle is often brought forth as an argument in favor of or against some competing view, on the grounds that its competitor is a ‘simpler’ explanation, and thus to be preferred. “There is no logical impossibility in the supposition that the whole of life is a dream, in which we ourselves create all the objects that come before us. But although this is not logically impossible, there is no reason whatsoever to suppose that it is true, and it is, in fact, a less simple hypothesis, viewed as a means of accounting for the facts of our own life, than the commonsense hypothesis that there really are objects independent of us, whose actions on us cause our sensations” (Bertrand Russell, The Problems of Philosophy, 23). “were it necessary to add any farther proof against the existence of matter after what has been said, I could instance several of those errors and difficulties (not to mention impieties) which have sprung from that tenet. It has occasioned numberless controversies and disputes in philosophy, and not a few of far greater moment in religion…it is very obvious, upon the least inquiry into our thoughts, to know whether it is possible for us to understand what is meant by the absolute existence of sensible objects in themselves, or without the mind. To me it is evident those words mark out either a direct contradiction, or else nothing at all” (George Berkeley, A Treatise Concerning the Principles of Human Knowledge, II pp. 24). Let’s be honest ladies and gentlemen, much as none of us today would really wish to be Idealists, the man has a point. Accepting the existence of mind-independent material objects brings us the mind-body problem, the question of primary and secondary qualities and the relation of sense data to physics, not to mention the endless bickering between materialists and their wide array of opponents in matters of religion and spirituality. Might it not just be ‘simpler’ to let matter go, to just give up the fight and think there are no tables and chairs, no atoms or quarks after all, and that perhaps we really are just mind-things into which God is beaming an endless stream of thoughts and sense experiences? I hope you’ll trust me when I say that I mean this latter suggestion in jest, but I believe the dichotomy between these two passages illustrates my point; both authors are, in some sense, claiming that the principle of parsimony is on their side. Particularly, Russell is claiming that the commonsense materialist view has the advantage of epistemic parsimony while Berkeley claims that the Idealist view has the advantage of ontological parsimony, and sadly, both are right. Berkley’s mentioning of the “numberless controversies and disputes in philosophy” (the mind-body problem and the problems of physics that I mentioned being only a few) illustrates his at least implicit perspective that talk of ‘mind independent matter’ is really just troublesome hogwash, and his view, which eliminates two extensive classes of objects (material objects and abstractions) from our ontology is therefore simpler. Russell’s claim to parsimony, on the other hand, is that Idealism, as ontologically parsimonious as it may seem, is an extremely counterintuitive view, one that goes against our most deeply seated beliefs about the nature of the world in which we live, and that at the end of the day we ought to shut up and simply accept what seems like the most direct explanation rather than jumping through mental and epistemological hoops in order to justify such a bizarre perspective. But it isn’t only in this relatively outdated philosophical debate that we see such use of the principle of parsimony; there is another area where we see “Ockham’s razor” being brandished more like a battle axe, with multiple sides claiming to have beheaded their irrational philosophical nemeses. The starkest example of this behavior is in the philosophy of religion, which I have already mentioned as an area that, in my experience, draws a great deal of use of this principle. A simple example is the perennial debate between Atheists and believers over such ‘modern miracle’ stories as the apparitions at Fatima in Portugal in the early 20th century, as well as miraculous accounts of such modern Saints as Padre Pio (please note in the following that I take no stand as to which side has a better case in these debates, I am using them only to illustrate a philosophical point). Accounts such as these, unlike their historical antecedents back to the time of the Gospels or other religious texts, took place in relatively modern times, when details of modern science and medicine were finally being codified and understood. Furthermore, many of these supposed miracles were witnessed by dozens, hundreds, or even thousands or hundreds of thousands of people, and seem to nevertheless defy explanation through ordinary scientific means. The debate then, is between the skeptics and the Atheists and their religious opponents, and once again both claim to have the principle of parsimony on their side. Specifically, the Atheists very fairly point out that the ontology of naturalistic science, with its atoms and quarks, molecules and cells, stars and planets etc., leaves no room for Virgin Mary’s, angels, demons, ghosts or God, yet has very reliably allowed us to make massive strides in our understanding of the world around us. Oughtn’t we then eliminate such troublesome entities from our ontology, and ascribe such fantastic, miraculous tales to far more ordinary modes of explanation? Yet the religious believers shoot back with their own variant of the principle of parsimony, and once again not without some plausibility; presumably the more witnesses that observe a particular event, the more likely it is that that event occurred, and moreover occurred in a way pretty similar to the way in which most witnesses described it. So when several thousand people seem to see an apparition of the Virgin Mary before them, why would we not simply conclude that several thousand people did, in fact, happen to see the Virgin Mary? Why bother jumping through epistemic hoops trying to give accounts concerning “mass hysteria” or “mass hallucinations,” why not simply conclude that the people saw what they said they saw? After all, “mass hysteria,” “mass hallucinations” and all other such naturalistic accounts of such miraculous tales (which, though I am personally agnostic when it comes to Virgin Mary apparitions, I must confess often seem to be rather far-fetched to me, as scientific as they try to be) are only invoked for such fantastic accounts of the supernatural; there never seem to be “mass hallucinations” of perfectly ordinary, benign events or even of fantastic or tragic occurrences that are nevertheless entirely ‘natural’ in character. Once again, both sides are claiming to have the more ‘parsimonious’ explanation; who really does? My own reflection, upon having observed how much use (and in my opinion, abuse) has been made of this principle, is that it is rather like a great many concepts and ideals being thrown around in our social media and culture today; concepts and ideals such as “free speech,” “personal liberty,” “family values,” etc. All of these are ideals that just about anyone you ask is “for;” we rarely encounter a person in favor of censorship, oppression or gratuitous turpitude. Instead, what we encounter are vast groups of people using these same words in very different ways, ways so different that I personally suspect different groups don’t even mean the same things by them. Personally (and in a blatantly self-serving spirit) I think that these vast camps, these diametrically opposed groups, ought to stop talking and start studying a little bit more philosophy, and perhaps engage in some actual deep thought for once. What constitutes “freedom of speech,” and how do we balance peoples’ right to profess whatever belief they want against the corruption of this right as a defense of outright lying by those with power? While obviously people have a right to self-determination, how do we balance this with considerations about the way in which one’s self determination does, in fact, influence others; for instance, the way that a person who smokes can ultimately put tremendous strain on the healthcare and insurance system should they become sick, which obviously will impact others. And why, exactly, are we all entitled to these natural rights, these inalienable privileges that we hold dear? Certainly I value them as much as anyone else and would never want to see any of them taken away; but I often wonder what the grounds are, specifically, for believing that our fellow humans are entitled to a degree of respect and autonomy. I wonder what these grounds are, not in a spirit of skepticism, but rather because I feel that perhaps analyzing them more, making them more systematic and reflecting upon them more, might help us to achieve a better society overall, as well as shed light on those ethical questions we all face in our cultural and our personal lives as well. But to conclude, what is there to say about parsimony, about Ockham’s famous, much used, and perhaps now rather dull, razor? I think that the debates in the philosophy of religion, as well as the classic interchange between the Idealists and the Materialists, illustrates the way in which the principle of parsimony is supposed to work; it is after the consideration of all the other factors that weigh into our judgment of the rationality of a philosophical position that we must finally take parsimony into account. Parsimony is “the icing on the cake,” in a manner of speaking, the tie-breaker that determines the winner of the rationality contest once other considerations, such as internal consistency have been weighed. Seen this way the principle does emerge as a definite judge between opposing views; when we take parsimony into account on top of those other philosophical factors, it serves as a very illuminating and powerful form of rational persuasion. But, as I believe the passages from Russell and Berkeley show, taken on its own, parsimony is relatively unhelpful. Like all philosophical positions and methodologies, parsimony, in the end, ought to be weighed in context of an overall framework that defies simple reduction to binary, black-and-white distinctions, or to so simple a tool as a humble razor.